After last week, I started writing this post. Then I read these other two amazing women and thought I would share their words on coping with the violence and injustice: Sarah from Left Brain Buddha writes about mindful, compassionate action, and Janelle from Renegade Mothering writes a letter to James Baldwin about his ideas of transformational love in The Fire Next Time–I read The Fire Next Time this past winter and was appalled at how little has changed for the black experience in America. Whenever something this violent happens, I am drawn to concrete action. I am tired of weeping, feeling sick to my stomach, lamenting, venting. None of these do a damn bit of good. None of these make change. 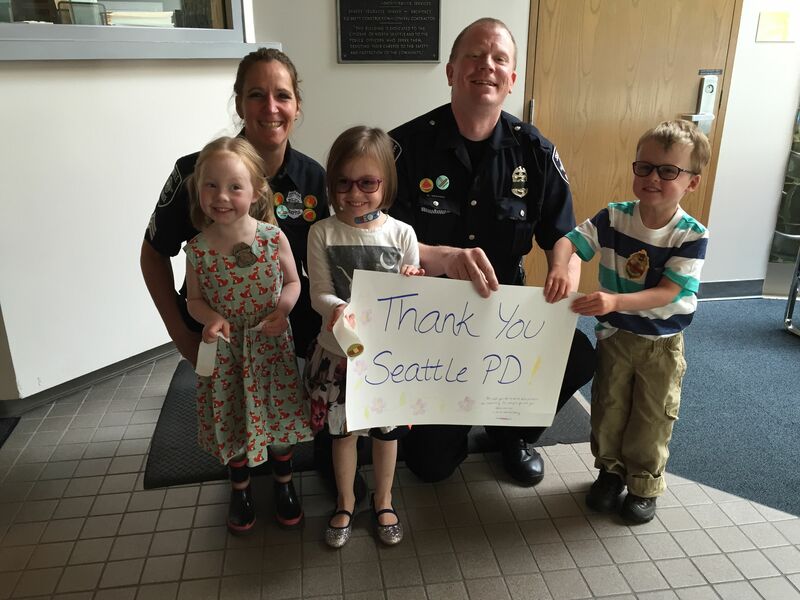 So we went to the grocery store after church, piled two bags full of snacks, and brought them plus a thank-you sign to the North Seattle Police Precinct. The two officers staffing the lobby told us that they had received flowers and other messages of gratitude from people in the community following the shootings in Dallas last week. My kids told them about their uncle, also a police officer, who tries to eat their carrots. They gave the officers stickers, and the officers gave them Junior Police badges. Now, watching the furor that has erupted over the latest officer-involved shootings of black men, [community corrections officer Cynthia Softli] said that such images — caught on video and watched over and over again — make it seem like racist violence by police is pervasive. Yet she said she knows the other 5 percent could have a tremendous impact on people’s lives. I support law enforcement officers. I support undoing institutional racism. 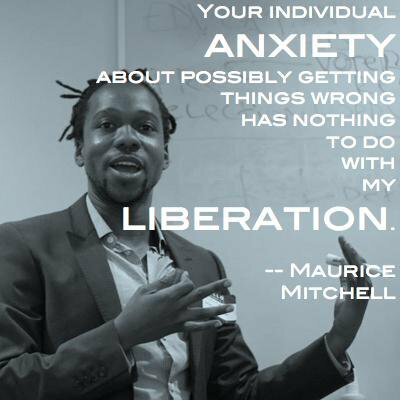 We should not be made to feel as though they are mutually exclusive. I joined our school’s new Racial Equity Team and went to my first meeting in June. At the meeting, facing parents and students of color whom I did not know and colleagues of color whom I both know and greatly respect, I was so scared to say the wrong thing. I understood how some of my white students felt when I tried to have class discussions about race and they were stolidly silent. If you don’t say anything, you can’t hurt someone’s feelings. You can’t be offensive or unintentionally racist. After that meeting, I went over and over the conversation in my head: what could I have said? How could I have been more empathetic? Ultimately I realized: This. Is. Not. About. Me. It’s not about my discomfort. Not about my defensiveness. Not about my best intentions. It’s about listening to the experiences that people of color bring to the literal and metaphorical table. It’s about sitting with the awful recognition that we are all complicit in perpetuating a system of oppression. It’s about facing that truth, no matter how ugly or horrifying, and not turning away. It’s about doing work that ensures safety and freedom for every American–the safety and freedom that its founding documents claims to provide. Work that every single one of us needs to do. It’s about trying to move past my intense frustration with people whose defensiveness and deafness solidify the walls that keep us apart. But then, this can happen. 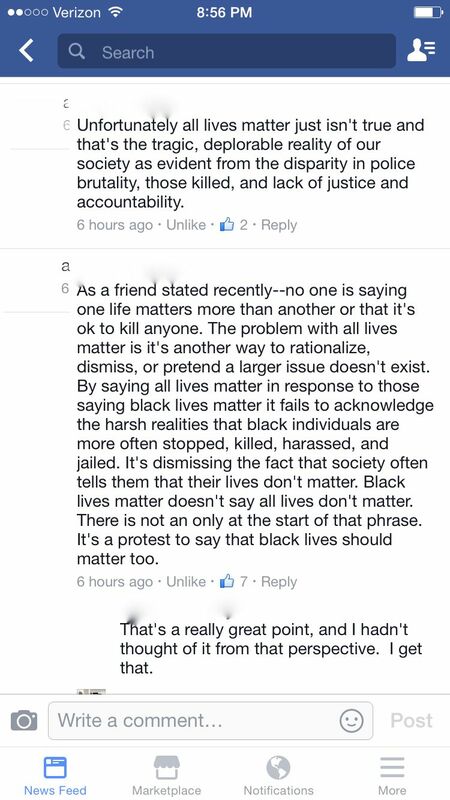 And my friend truly listened, then responded in a civil, reflective way. Would that more of us could do the same. Undoing oppression is not about extending an invitation to any oppressed group to sit at our table. It’s about all of us working together to create a new table. 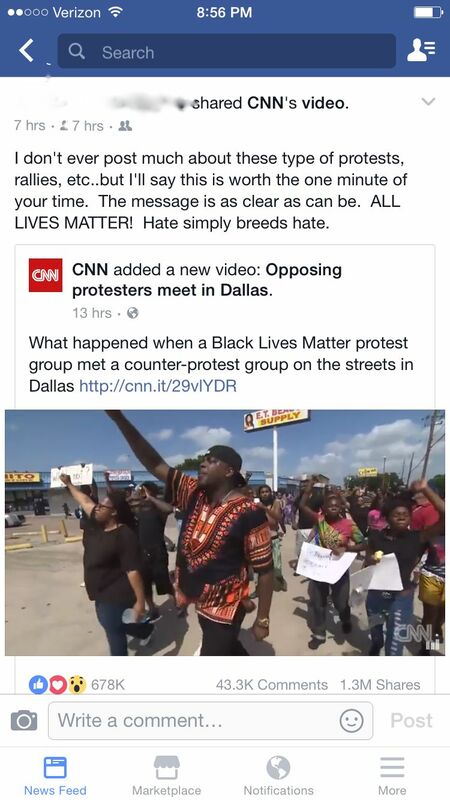 And my favorite: a law professor’s response to a Black Lives Matter shirt complaint. Read both letters. The professor’s response is phenomenal.